Some disabled rights advocates are speaking out against an emerging trend of restaurants and other companies phasing out the use of plastic straws with drink orders, arguing that the alternatives can be inadequate for customers with various disabilities. Plastic straws have been disappearing from coffee shops, airlines, hotels and more amid concerns that they frequently wind up as ocean waste, presenting an environmental hazard. The campaign against them accelerated this week amid news that major companies like Starbucks, American Airlines and Hyatt are drastically reducing their use, in some cases opting for straw-less plastic tops on some drinks instead. 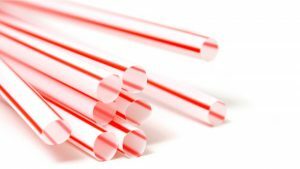 But disability advocates say they feel the campaign against plastic straws is being waged without adequate input from disabled customers.